Lasagne is one of those meals that is loved the whole family. Let’s face it, if you don’t love lasagne then you are very usual! Often seen as hard to make, time consuming and more comfort food than “healthy” I want to share my top tips for making it a standard weeknight family meal. Pack in the veggies. Lasagne does not have to include meat! I rarely use mince to make lasagne these days. Instead I use lasagne as a way to pack in the veg. You can use lentils, beans or tofu or quorn to get protein in. There is nothing wrong with using the normal beef mince but if you are looking for more variety with meals or like us, are wanting to eat a greater range of plant based protein sources then it’s time to expand your lasagne repertoire. Making your own sauce doesn’t have to be complicated. As much as I love a white sauce, if I’m in a rush it always goes lumpy or I burn the bottom of the pan. One of my hacks is to use cottage cheese. Add a little natural yoghurt to thin it down and pour it on the top of the lasagne, top with grated cheese and the jobs done. I wasn’t convinced this sauce would pass the lasagne police in my house but it did. Phew. The other easy alternative is to use a half fat creme fraiche, simple. Embrace your freezer. I totally love my freezer, it saves me on a regular basis. Oh, and it needs defrosting, in case anyone fancies helping me with that. You can either make a double batch of the main filling and freeze it for another meal, or I like to make a whole lasagne and freeze it, makes me feel like a proper domestic goddess. Minus the tidy kitchen, mine is never tidy. Make ahead. I often make lasagne in stages. so I will either get the main filling out of the freezer and leave to defrost, or make the filling up and leave it. Then later I get a child to help me put it together, layering the filling, pasta and sauce. Use pre-bought lasagne sheets. I know most people don’t make their own fresh lasagne sheets, but I sometimes do, it makes the lasagne SO good, literally the best lasagne. But it takes more time that I just don’t have that often. Chop all the vegetables in a food processor (this saves time!) or chop finely by hand. Saute in the oil for a few minutes, then add the lentils, chopped tomatoes, tomato puree, bay leaf, dried herbs, balsamic, stock and simmer for 20 minutes. This is your basic lasagne filling, You can now freeze this, keep it in the fridge for making up later, or use straight away. 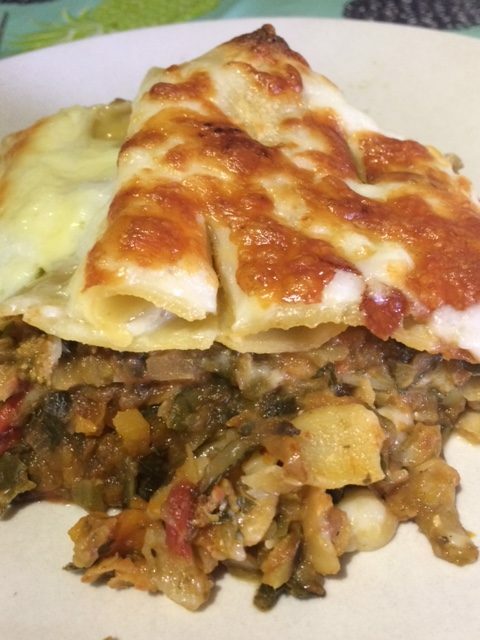 Make up the lasagne with 1 layer of lentil mix, lasagne sheets, lentil mix and lasagne sheets. Pour the oil into a sauce pan and mix in the flour with a wooden spoon, it will make a thick paste. Mix in a little milk and stir to make a batter, now add in the rest of the milk place on a gentle heat and keep stirring to incorporate it all. The sauce will thicken, if it is too thick add some water. Keep stirring! Let it gently bubble but not too much. I like to let it cool a little and then pour on top of the lasagne. Top with cheese and bake at gas mark 5 for 45 minutes.